Blast off with reading with 3M! 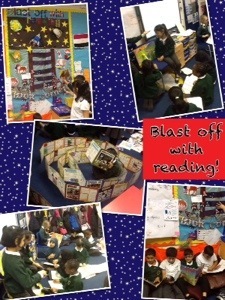 We all love reading in 3M it’s a fun thing and enjoy blasting off in the book corner. We especially love our dinosaur comics, non fiction and joke books. They are also scary and funny. Our favourite authors are Roald Dahl, Anne Fine and Judy Blume. During free choice reading we like to take the box of dinosaur magazines and share these with each other on the carpet, we read and pretend we are teachers to share the books with our friends too. Our new activity that we really enjoy is putting out all the animals books and sit in the middle and read all the facts together. Have a look at our photos. By Simran and Devinder. Today Mr Shepherd has shown us a new website where there are examples of us playing some songs during our Ukulele lesson. We have started to learn to play jingle bells, have a listen and each week there will be a new upload to see our progress. Have a look on the website and see what you think! Miss Louwnes was a brilliant reader for 3M today, we really enjoyed her coming to our class to share her favourite book The Twits. She read 3 chapters, the chapters name were Mrs Twit has the shrinks, Mrs Twit gets a stretching and Mr Twit gets a horrid shock. My favourite part was when Mr Twit gets a shock, this was funny because Miss Louwnes changed her voice to be Mr Twit. I hope Miss comes to our class to share another book! 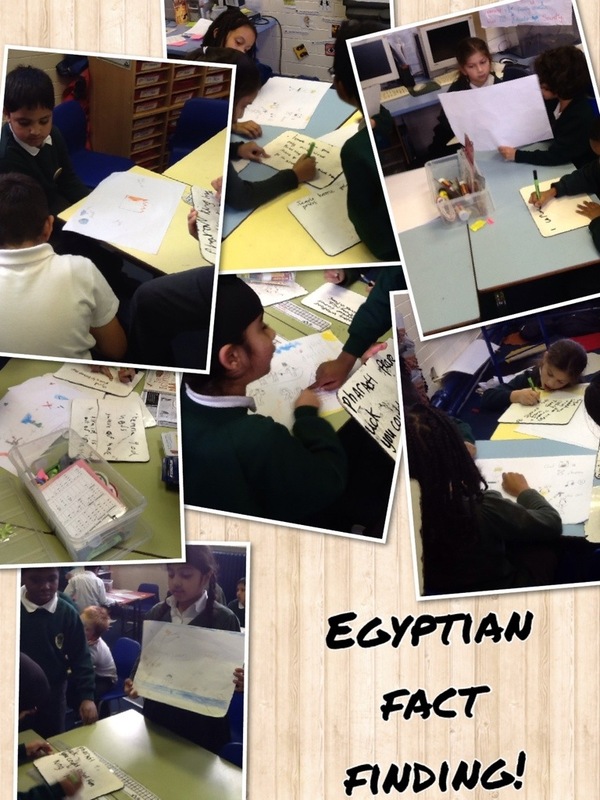 I hope we get another surprise visitor soon…..
We looked at a piece of information about the Egyptians. Each table had a different sheet. Some were about Priests, Pharaohs and even farmers. 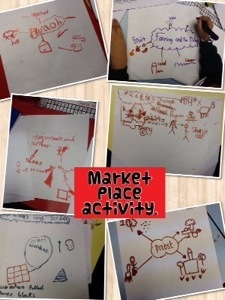 Miss introduced to a new activity called ‘the market place’, we were confused what we would have to do in this activity! In our groups we had to read the information sheet to know about that topic. Then we had to choose a child teacher. Next we presented the information using no more than 6 words and 6 pictures. Next you had to turn the information sheet over. Finally we had to share the pictures/words with other groups and explain the information. Today we were really excited because we had wrote a list as a class of all the adults in school that we would like to read a story to us. Suddenly Mr Murphy arrived holding a parcel wrapped up, he told us that he had to come to share his favourite book with us. It was called The Paper Bag Prince, it was lots of fun and exciting to have Mr Murphy read to us especially as he hadn’t read to us before! So when Miss Mulkit and Miss Mortimer told us there was a suprise I never imagined that ! The Paper Bag Prince was really exciting as it had lots of super pictures in that all told a different story. We think that if you read this book you would really enjoy it. 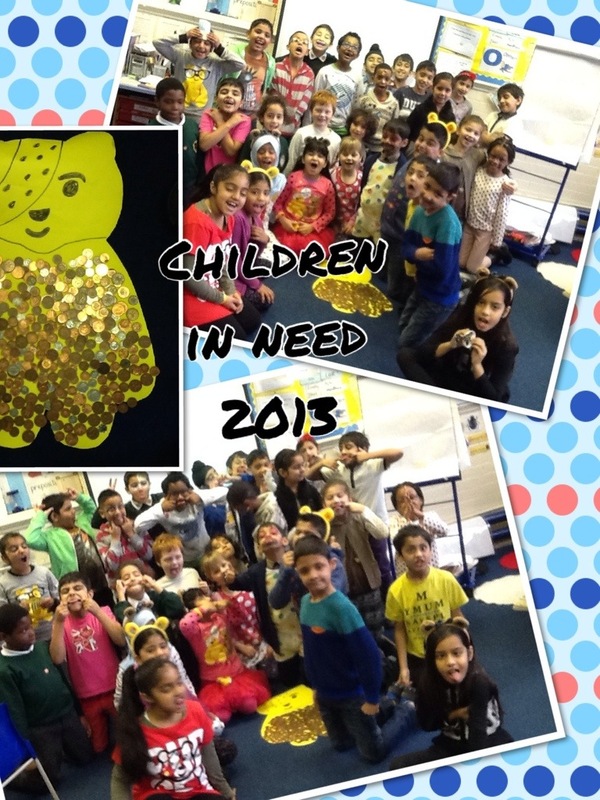 We hope that we have another visitor come to our class to read as we have sent out invitations to them! 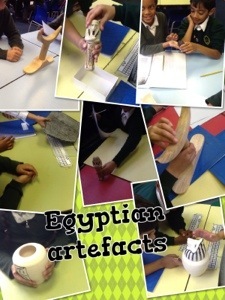 Today in topic we looked at some different Egyptian artefacts. We held them and thought about what they could be. In topic we have been learning about Egyptian jobs. I enjoyed making our poster to tell the children in my class all about Priests. It was hard to only use 5 words. We have been looking at the stories Theseus and the Minotaur and Perseus and Medusa. We used a text map to re-tell the stories using actions to help us make a good performance. We have watched different performances and created a WILF of the most important things to consider when performing. Have a look at the performances and tell us what you think.